Creatus isn’t your normal paranormal romance … it’s a romantic mystery series based on the myths you’ve heard your entire life. ​For more info, visit your favorite retailer! If you’ve already read the Creatus series, the new release in the follow-up series, Creatus Talis (A New Breed), is now available. Amazon – Google Play – iTunes – Nook – Kobo – Audible! If you’ve already downloaded the Creatus Series Boxed Set, see the bottom of the page for instructions on how to update it. If you haven’t started the Creatus series yet, start with this FREE 2-Book Edition! And if you’ve been buying the series individually, the New Release, Creatus Animus, is now available. If you’re not sure if you have all the books, visit the Creatus series page on Amazon. Amazon shows you which books you have–or don’t have. And, as requested, the series will be available at ALL retailers! 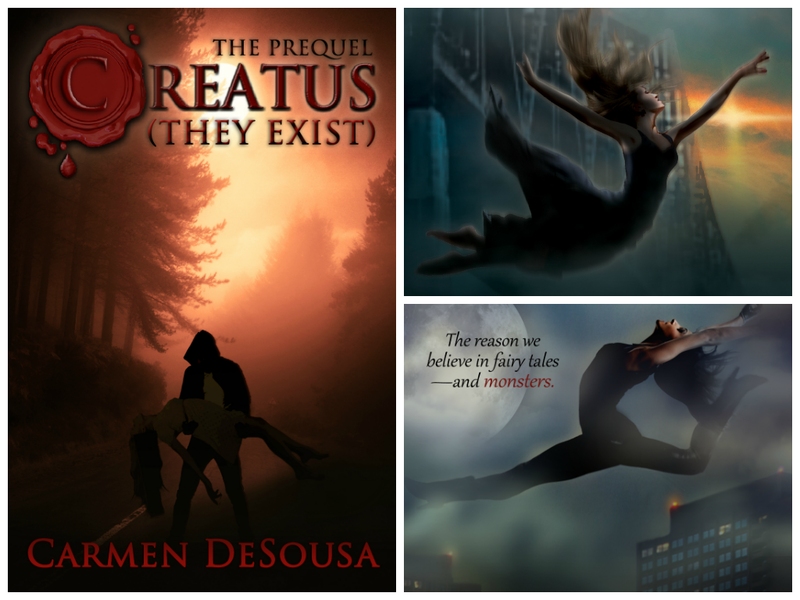 The Prequel, Creatus (They Exist), and Book One, are ABSOLUTELY FREE in this two-book set! 5.0 out of 5 stars Never thought I would be reading a romance novel. Never thought I would enjoy reading a romance novel. I hate them. I gave this series a chance only because I was curious about who existed, what is a creatus? Once I read the first of the series, I was hooked. Could not stop reading. Normally, I would stop in between the series and read another book before starting the next book of a series. With this book, I could not stop. I had to find out what’s coming next. It was well written, and I did enjoy the characters. I even enjoyed the antagonist of the book. For me, what made it a good read is the combination of the super heroism, supernatural, mystery and suspense ( oh yeah, the romance). All in one series. If you do decide to read it, just buy the set. You will not be disappointed. What a surprise…it is not a vampire, not a shape shifter but something totally different. I loved the characters. Excellent series! Completely different than anything I’ve read lately. It has just the right amount of mystery, action, scifi, love, hate, conflict, and new ideas. It kept me on my toes, surprised me and gave into what I hoped would happen. The characters are well developed and I love learning about them all. 5.0 out of 5 stars Human or something more? I loved this series. It had me looking at people differently. Are you just my neighbor, just my boss, or another species hiding in plain sight. Creatus Series Boxed Set is only $5.99! Creatus Series Boxed Set – Includes All Five Books! As an author, I’ve learned that no matter what you write, how you describe what you wrote, or what other reviewers commented about what you wrote, there will still be readers who don’t get it. Just one of my many book descriptions: Ancient myths, superheroes, vampires… Forget everything you’ve heard. Yes, those two reviews were from the same book, and they were back to back. LOL! My thoughts… Since the beginning of the written word, storytellers have shared myths about supernatural beings. So, I did tons and tons of research about vampires, superheroes, and other myths, since they all share common traits, and I wanted to tell a story based on what seemed logical to me. CREATUS, from the Latin word meaning “created” are the reason we believe in fairy tales—and monsters. Superheroes didn’t come about from being bitten by a vampire, a werewolf, or a spider. Instead, perhaps the same superior being who created us created them. And best of all…you can start the series FREE with the first two books! Hope you enjoy my twist on an ancient myth. How well do you know the Creatus? Simply send your answers to Carmen [@] Carmen DeSousa [DOT] com. If you’ve only read the prequel, send me your answers, and each month, I’ll send one reader the boxed set. Yes, you can enter every month until you win. BUT…if you don’t want to wait to win and go ahead and read all the books and answer all the questions, I’ll register you to win the complete set of my Southern Romantic-Suspense Collection. That’s five books with a value of $20.95! This is an ongoing contest through December 2014. The first night Derrick meets Janelle, where does he follow her home from? How is Janelle related to Kristina? What mythical creatures are creatus most like? What’s special about Derrick’s mom? What secret does Ry share with Vic? Who said: Maybe she was dead, because she could swear she’d just heard him say he’d be back. What city is the safe house in? What’s the VERY last word in the boxed set…before Amazon asks you to rate the book?